Strength machines provide stability that you won't get with free weights and they guide you through the movement so you don't have to worry as much about your form. This makes them great for beginners or people rehabbing an injury. The most common type of strength machine for home use is a universal-type cable machine. It allows for multiple exercises and accessories and attachments in a minimum of floor space. Most machines for home use are stack-loaded. That means there is a stack of rectangular weights attached to the machine and you move a pin to adjust the weight. This makes it easy to quickly move from one exercise to the next. You don't have to make a lot of adjustments and you don't have to take time to unload and reload weight plates. The Bowflex, while not a stack-loaded machine, is another well known version of a home fitness machine that provides variable resistance. There are numerous brands of strength machines on the market that you'll find in health clubs and gyms everywhere. These full lines of equipment are often set up in a circuit and have one dedicated machine for each individual muscle or muscle group. While they provide an excellent workout, they're not practical for the average home gym. Unless, of course, you have a huge empty basement or garage to set up 15 different machines. In which case, the rest of us home exercisers are jealous! If you have the space and the money to buy a machine that will give you a large variety of exercises and a complete workout (like the one pictured above), go for it! If your workout space is small and your budget is limited, look for a strength machine or piece of equipment that will supplement your workouts. Such as a bench with a back that adjusts to several angles and leg extension/leg curl attachment. Something like this does require you to load and unload weight plates but is a great addition to a home gym. 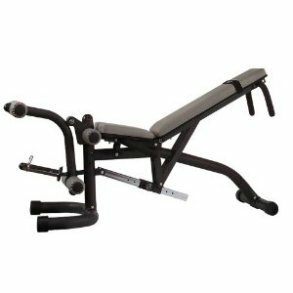 You can add a wide variety of exercises to your workouts with something as simple as the bench pictured below.